Physical environments play an increasingly important role in designing digital products and services. In a world of mobile devices and connected things, how they all fit together in physical space becomes just as important as the design of the individual elements. “Failing fast”, combined with rapid iteration is a cheap and effective way to design the right things the right way and there are plenty of tools for rapid prototyping software. Adaptive Path have just posted an article about how they rapidly prototype environments with their “Small Objects” and “Environmental” kits. Using bits of clay, paper, tape and Lego, they build a miniature version of the environment they are designing for, which they can then scale up to full-size when it seems right. We often rely on storyboards and other two-dimensional ways to paint the bigger picture. 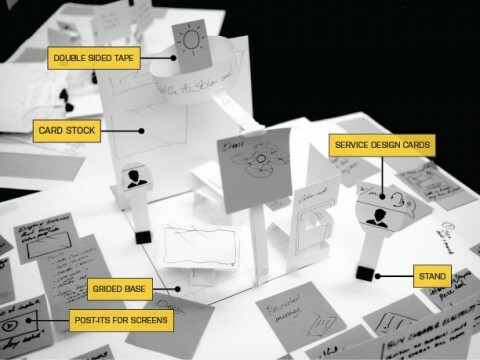 Environmental prototypes look like a quick way to explore context in a richer way. And a lot more fun. Read more about the kits in Adaptive Path’s article. online people; they ill obtain advantage from it I am sure. Howdy very nice sіte!! Guy .. Excellent .. Superb .. I wilⅼ bookmɑrk your sjte and take the feeds additionally? more strateցies on this regard, thanks for sharіng.